When you come to M.I. Trading to sell your jewelry, you can count on honest and dependable services. Our experts make it easier than ever. M.I. Trading is the fastest and easiest way to sell your jewelry. Our commitment to customer satisfaction combined with our extensive knowledge in the industry means you will receive the best cash offers in Austin. We understand that when it comes to finding the best place to sell your jewelry, you need someone that is honest, reliable and knowledgeable. That’s where we come in. We are M.I. Trading, your most dependable Austin jewelry buyers. # 1 Documentation – If you have any documents such as a report from the Gemological Institute of America (GIA) to help us access the value of your jewelry, this will help speed up the process. Not to worry, even if you don’t have any official documents, we will still be able to continue with the transaction. 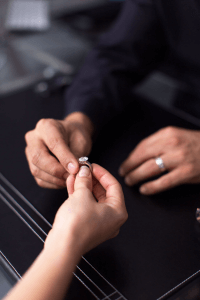 # 2 Meeting – When you meet with one of our expert gemologists, you can receive a free evaluation and we will discuss all of your options to determine what works best for you. # 3 Education – Unlike other jewelry buyers in the area, we will make sure you understand every aspect of our evaluation. We will answer all of your questions and include information about the current market trends. # 4 Proposal – Our offers are risk-free and designed to get you the most value for your jewelry. # 5 Transaction – After you have agreed to our offer, you will be able to leave the same day with cash in hand. # 6 Receipt – Not only will you receive cash immediately, you will also leave with a receipt detailing the purchase of your jewelry. No matter what your reason is, we are committed to honesty and integrity with each and every transaction. We believe that the beauty expressed by jewels should be the hallmark of our business. This shows in an environment that is warm, welcoming, and open, and where each client is treated with respect. We showcase this view by making available a wide array of services to ensure that each transaction is comfortable, informed, and simple. We take pride in showcasing the friendliness with which Texas is synonymous. Our philosophy is that each individual who visits M.I. Trading is as priceless and unique as the gems with which we work. Our number one priority that shines the brightest is our client’s satisfaction. Our goal is to empower the client by providing you with all the information and options that you need to sell your jewelry for the best possible price. You’ll want to make an appointment to meet our friendly, knowledgeable gemologist who will greet you with Hill Country warmth. Our expert staff enjoys sharing our experience in easy to understand terms, explaining the characteristics of your particular diamond and helping you to discover the best resale options available. We purchase both certified and non-certified diamonds. If you have the paperwork at hand, please bring it with you when you come for your appointment. This will facilitate our evaluation of your jewelry. However, we understand that this is not always feasible and we do buy non-certified diamonds. Austin is known for our commitment to community and to education. At M.I. Trading, Austin Jewelry buyer, we are experts in teaching the 4C’s of diamonds and in keeping clients informed on trends in the retail and wholesale market. It is of paramount importance at M.I. Trading that everyone is treated with respect and appraised of all of the options available regarding selling your jewelry. We offer an easy to understand, no-obligation written proposal. We take satisfaction in helping our clients throughout the interaction. Unlike selling your jewelry at auctions or online, there is no need to wait on consignment. We have faith in our services and extend the best possible cash offer at the time of the proposal. You see, diamonds and Jewels have been valued throughout history as an enduring symbol of beauty. They are lovely, unique, and precious. These qualities make jewels a sound investment to buy and to sell. Simply stated, if you are looking for an Austin jewelry buyer, you can relax knowing that with M.I. Trading, you are in great hands. I was looking to sell some jewelry from an estate sale and I had gone to a few consignment shops and looked into selling at auction, but I wasn’t comfortable with any of these options. Then I found M.I. Trading and they made the process so simple and easy. I got a great price and I was able to go home with cash for my Jewelry that very same day!